Libraries are often rated as a favorite government service, according to public opinions expressed to pollsters. When queried, people recall the pleasurable and benefit of visiting a library as a child and student. This nostalgia is nice to read but dangerous to rely on for future public support of libraries. According to Digital Public Library chairman John Palfrey, libraries need to stay vital and relevant by transitioning to a digital knowledge base. Why does it matter? The survival of our democracy is at stake. The way for libraries will not be easy in a society that is increasing ruled by for-profit information services. Google, Amazon, and Apple are dictating how people obtain digital products. Adapting to their protocols and the copyright demands of publishers of digital books has made the library digital makeover difficult to negotiate. Librarians must network and unify to stand with the corporations and their seemingly unlimited reserves of funds and code writers. Palfrey also calls for libraries to fund their own research and development and spend liberally in staff development. Without such an effort, libraries will be the powerless captive customer of corporate digital vendors. We already see the results of weakness in our schools where librarians and teachers are being fired to let private interests provide information and teaching systems. Democracy begins with good public schools with a tradition for teaching truth and problem solving. Community libraries and those of academia are also on the line. We are not defeated yet. Palfrey offers a plan for libraries to transition to digital platforms while keeping printed books and public spaces for study and dialogue. I hope his book is widely read soon. Palfrey, John. 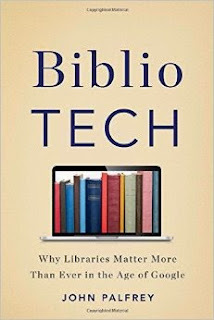 Biblio Tech: Why Libraries Matter More Than Ever in the Age of Google. Basic Books, 2015. 280p. ISBN 9780465042999.